My family love apple based desserts. I had promised them a strudel earlier in the day, but I didn't feel like working with filo pastry, buttering each layer etc, I wanted to make something simpler. Then I remembered I had made this Jalousie years ago, so I found the recipe and set about making it. 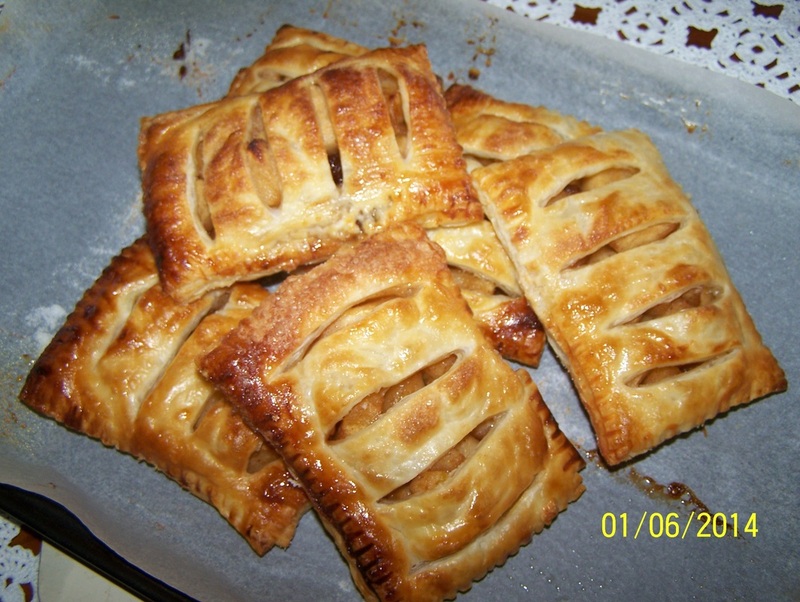 A Jalousie is a French version of a strudel, it uses puff pastry instead of filo. 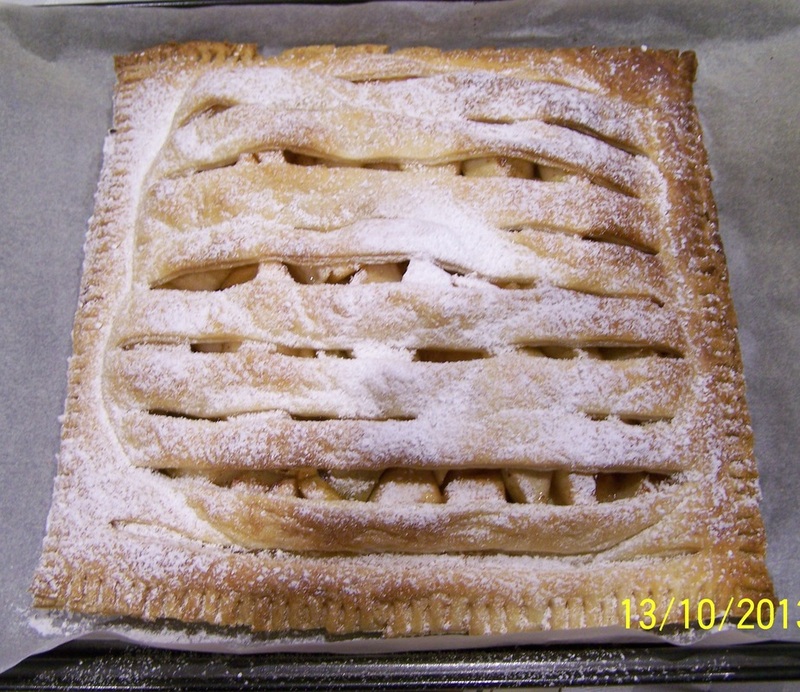 The name comes from how the top pastry is cut, when it placed on the apple filling with the slashes in it, it resembles venetian blinds (jalousie in French). This recipe is really easy, and if you are like me, you will have everything in your pantry ready to make this. It is a great dessert if you get unexpected guests coming over. It is quicker to make, than going out and buying something. I double the recipe for the apples, so I can make it two days in a row, my family never complains if this is served twice. Also instead of making one large pie, you can make 6 smaller pies, my kids like them smaller. With the cinnamon and nutmeg, it is to taste, I put the amount the recipe suggests, you can add more or less, that is up to you. With the apples, today I used Granny Smith Apples, but use whatever apple you like or have in the house. Also the recipe states to cool the apple mix completely. But if you are pressed for time, pour the apples in a large bowl, stir it every few minutes, to allow it to cool quicker. I cool it for as long as it takes for the pastry that I put the slashes through to soften enough to place on top. But if you can allow it to cool completely. It was absolutely delicious served with vanilla ice cream, really, really good. I loved it. Melt the butter and sugar in a large frying pan. Add the apple, lemon rind and lemon juice. Cook over medium heat, stirring occasionally, for 10 minutes, or until the apples are cooked and the mixture is thick and syrupy. Stir in the nutmeg, cinnamon and sultanas. Cool completely. Preheat the oven to hot 220C. Lightly grease a baking tray and line with baking paper. For large Jalousie: Place one sheet of puff pastry on the baking paper lined tray. Top with the apple mixture, leaving a 2.5cm border. Brush the border with a little of the beaten egg. To the other sheet of puff pastry, using a sharp knife, cut parallel slashes in the pastry across its width, leaving a 2cm border around the edge. 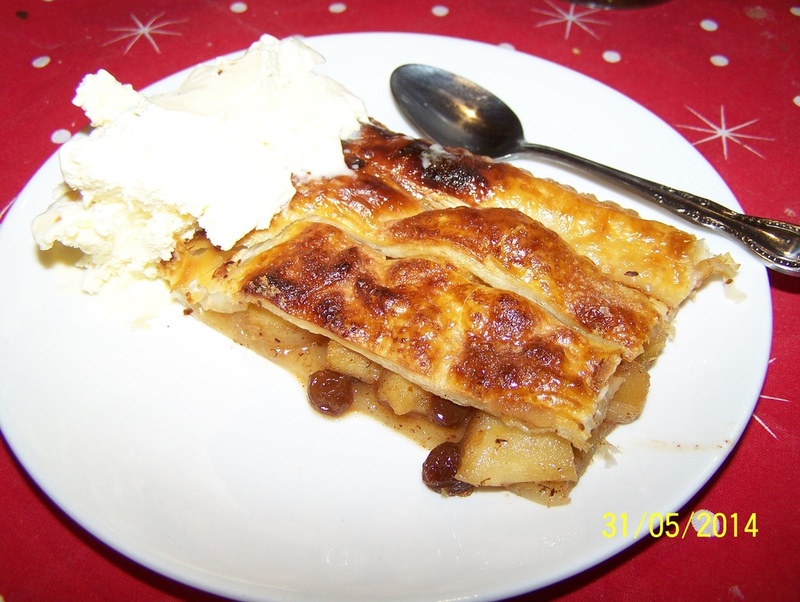 Place over the apple mixture, the slashes should open slightly when you place the pastry on top of the apple mixture. For smaller Jalousie: Cut one sheet of puff pastry into 6 rectangles (first cut into 3 long rectangles, then cut each long rectangle in half). Place on your prepared baking tray. Top with some of the apple mixture, leaving a 2cm border. Brush the border with a little of the beaten egg. 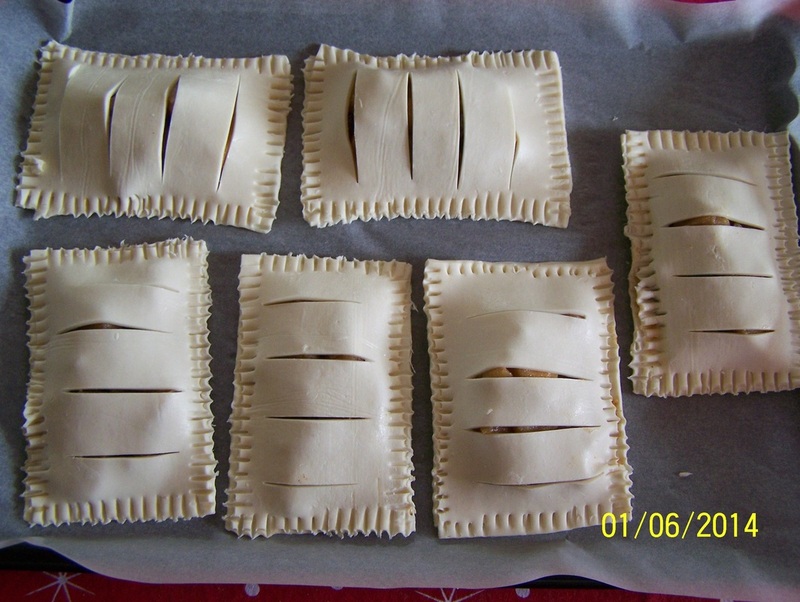 To the other sheet of puff pastry, cut it into 6 rectangles as you did with the first sheet, then using a sharp knife, cut parallel slashes in the pastry across its width, leaving a 2cm border around the edge. 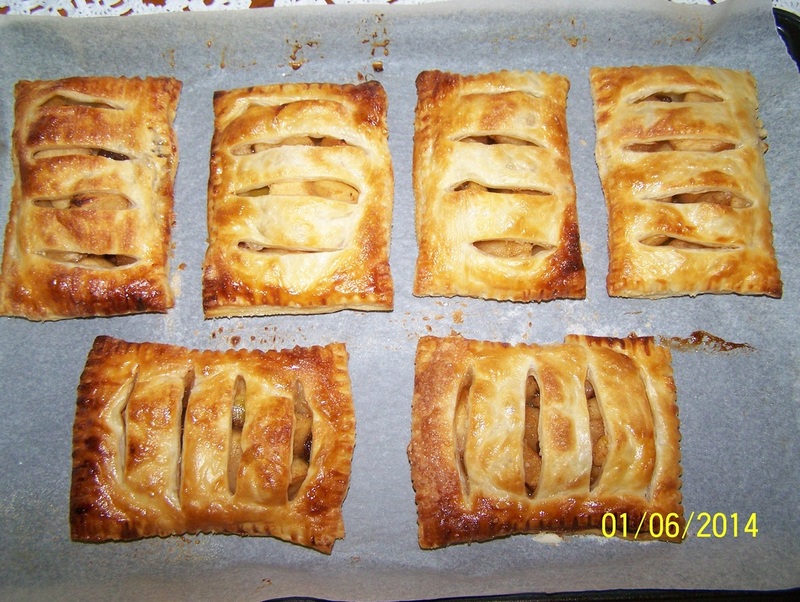 Place over the apple mixture, the slashes should open slightly when you place the pastry on top of the apple mixture. Slashes for the individual pies are shown here. Do the same to the whole sheet of puff pastry for the larger pie. Once you have placed the slashed pastry on top, using a fork, press the edges together. Glaze the pastry with some beaten egg, and sprinkle over a little caster sugar.